Featuring polyester knit fabric with very fine yarns, Pollen Guard Insect Screen allows air to flow into room while trapping most dust and pollen particles from entering, making it suitable for pollen allergy sufferers. Screen is available in 36Â in. x 100 ft and 48 in. x 100 ft contractor rolls. New York Wire .140Â in.Â spline is recommended for best fit in standard frame channel. (Grand Island, NY) – New York Wire™ introduces new Pollen Guard Insect Screen to their growing line of specialty screens. The new Pollen Guard screen features a unique polyester knit fabric design that creates a barrier for most pollen and dust particles. Pollen Guard screen is specially designed to block up to 50% more particles than standard fiberglass insect screen making it ideal for pollen allergy sufferers. 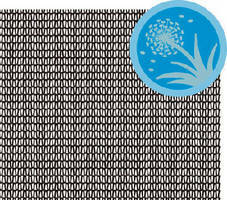 Featuring very fine, yet durable polyester yarns, this screen was uniquely designed to allow air to flow into a room, while trapping most dust and pollen particles from entering. Now there’s no reason to keep everything closed up during allergy season, keep your windows open and enjoy the breeze! Pollen Guard screen is easy to install and is available in 36” x 100’ and 48” x 100’ contractor rolls. We recommend using New York Wire .140” spline for the best fit in a standard frame channel. To get additional information on the New York Wire line of screening and accessories offered by Saint-Gobain ADFORS, visit www.newyorkwire.com. Saint-Gobain ADFORS is a division of the Saint-Gobain Group which specializes in the design, production and distribution of functional materials for the construction, industrial and consumer markets. The Group is organized into three business sectors: Construction Products, Building Materials Distribution, and Innovative Materials. Established in 64 countries, Saint-Gobain is the market leader in each of its core businesses. In 2013, it achieved more than $52.1 billion in sales with over 195,000 employees.